New Leaf is expanding to offer flights from Canada to U.S. destinations and one of their first routes is Edmonton to the Phoenix-Mesa, Arizona airport. The Phoenix-Mesa airport (AZA) is about a 40 minute drive from 'central' Phoenix. For reference, it's about 30 minutes further away than the typical Phoenix (PHX) airport that most people fly into. New Leaf is offering some cheaper prices on the introductory flights in January 2017. The flights from February to April 2017 are priced quite a bit higher. New Leaf will likely discount these at some point. Update 11/21 - New Leaf has now dropped their February to April 2017 flights from Edmonton to Phoenix-Mesa, Arzona down to $198 CAD roundtrip including taxes. Feb 4, 11, 25 -- new! Mar 4, 11 -- new! Apr 1, 8, 15 -- new! Feb 11, 18 -- new! Mar 11, 18 -- new! Apr 8, 15 -- new! Update 11/21 @ 3 PM MST - Showing just how determined they are to keep competing with New Leaf's low cost fares and try to eliminate them through competition, WestJet has announced that all of a sudden they too will be offering flights from Edmonton to Phoenix-Mesa, Arizona (AZA) ! 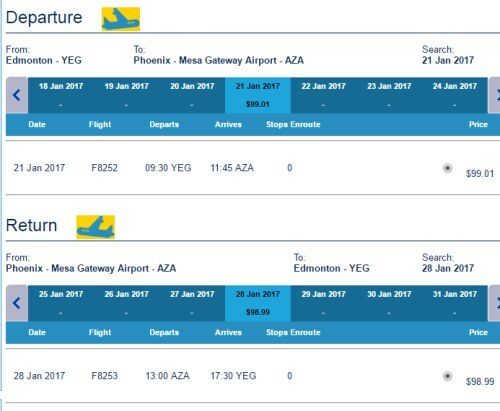 These flights aren't even showing up on WestJet.com yet, but there is a way you can book them already. 3. Try dates between January 21 and April 29, 2017. Most date combinations are showing up for somewhere between $228 and $356 CAD roundtrip including taxes. I would think at some point WestJet will drop most dates down closer to $197 roundtrip, like New Leaf has. - With WestJet, you can also book fares that originate in Phoenix-Mesa (such as a one-way from Phoenix-Mesa to Edmonton, or roundtrip from Phoenix-Mesa to Edmonton). You are not currently able to do this with New Leaf. 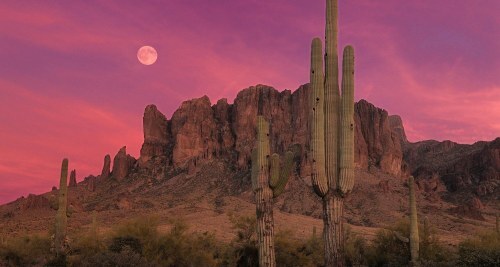 edmonton, yeg, flight deals, phoenix, arizona, united states, north america, new leaf and aza. 2 Responses to "Edmonton to Phoenix-Mesa, Arizona - $198 CAD roundtrip including taxes | New Leaf expands to U.S. destinations"
For those wondering why New Leaf is not offering flights that originate in Phoenix-Mesa, it's because they are new to the scene, and had to offer it as a chartered service first, using a charter license. By next winter they hope to offer it as a scheduled service, and then you would be able to book flights that originate in Phoenix-Mesa. Great news for snowbirds Looking forward to scheduled flights next year.